Based on the extremely successful open-source BeagleBone™ Black hardware design, BeagleBone™ Black Wireless is a high-expansion, maker-focused, community-supported open hardware computer created by the BeagleBoard.org® Foundation. Leveraging a partnership with Octavo Systems, BeagleBone™ Black Wireless is the easiest to use and modify credit-card sized IoT Linux computer. BeagleBone™ Black Wireless was designed with maximum connectivity in mind, trading in the 10/100 Ethernet port from BeagleBone Black for a high-performance 802.11 b/g/n 2.4GHz WiFi module with Bluetooth. Like BeagleBone Black, Wireless retains HDMI output, serial debug port, PC USB interface, USB 2.0 host, reset and power buttons, and adds two more status LEDs for WiFi and Bluetooth. Also retained is the 4GB of onboard eMMC memory with Debian Linux pre-installed, allowing BeagleBone Black Wireless to boot in around 10 seconds, and have you developing through your web browser in less than 5 minutes using just a single USB cable. 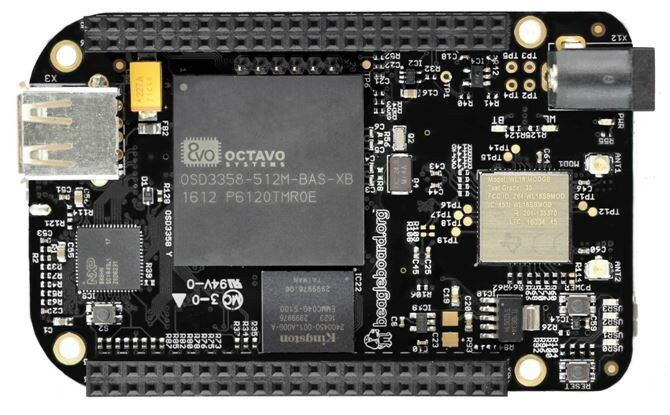 BeagleBone™ Black Wireless introduces the Octavo Systems OSD3358 SiP (system-in-package) which integrates BeagleBone functionality into one easy-to-use BGA package. The board is open source and designed in CadSoft EAGLE. This combination of an easy to use system-in-package and affordable design tools brings an entire new level of access for people wanting to make their own customized variations. BeagleBone™ Black Wireless is fully software, hardware and mechanically compatible with BeagleBone™ Black, and is even compatible with all existing BeagleBone™ Black capes for hardware expansion, integration, and peripherals.